On 9 April 2012, I saw Robert Sedgewick give the talk, “Algorithms for the Masses,” on the campus of Drexel University. I have several of Sedgewick’s books on my shelves at home, including Algorithms in Java, Third Edition, Parts 1-5 and Introduction to Programming in Java: An Interdisciplinary Approach . One of my previous computer science professors, Kenneth Sloan, counted Sedgewick among his classmates. The basic thesis of the lecture was that good algorithms matter and that we need to champion good algorithms where they are most needed (particularly in the sciences). One of his points was that computer science is currently very abstract and lacks a basis in the scientific method. Algorithms need to be tested against models to see how they actually perform. In some cases, the theoretical performance of an algorithm can be off by several orders of magnitude compared to actual performance. For example, the quicksort algorithm is quadratic (N2) in the worst case, but N log N most of the time. There’s a reason why quicksort (by the way, the subject of Sedgewick’s 1975 PhD dissertation) is widely used, in spite of the fact that it is O(N2) versus binary sort’s O(N log N). Sedgewick said, though, that he has run into many computer scientists who fail to observe the difference between theoretical worst-case and actual performance. Some will choose an algorithm based on Big-O analysis alone. Sedgewick’s response: Big-O is an upper bound, but is your input an example of the worst-case? Probably not. Algorithms should be chosen based on their actual performance. He also gave an example of taking theory too far in the other direction. A computer scientist gave a talk demonstrating that his algorithm, Algorithm B, though exceedingly complex, was superior to the simpler Algorithm A. When Sedgewick asked him why, he explained that Algorithm B removed a log log N factor. Sedgewick’s analysis was that log log N, in this universe, amounts to 6 — hardly worth trading algorithms for what, realistically, amounts to a constant factor. Another point was that scientists often need algorithms in their daily work, but do things the hard way for a lack of knowledge. One example was a biologist who was trying to use Excel to calculate a standard deviation for over a million data points, an idea that caused several audience members to cringe. From what I gather, analytic combinatorics is a way of using formal languages to describe recurrence relations, and thus a simpler (and easier-to-teach) method of creating generating functions. I don’t exactly know what that means, but you can read the book on it (by Flajolet and, of course, Sedgewick): Analytic Combinatorics (PDF). Sedgewick recommends identifying core elements of computer science, such as classic algorithms, and teaching them to everyone as early as possible. Some changes made to the curriculum at Princeton (where Sedgewick teaches) have led to a dramatic increase in enrollment in intro computer science courses and from a wider range of majors. He also criticized academic publishing for making journal articles look as much like boring print articles as possible, in spite of the fact that they are now primarily accessed online. Where are the full-color figures? The hyperlinks? Animated simulations? These things are all possible online, but instead publishers restrict content to the form that is least likely to be accessed. Several times in the lecture, he also mentioned that freshly-minted computer scientists often have little or no background in science: no physics, no chemistry, no biology. Although he recognized this as a problem, he had no solutions (other than to, perhaps, require foundational science courses as part of a CS degree). The last two items–changing the curriculum and publishing–really sounded like a Sedgewick paid-programming infomercial. “Everyone should take courses in the subject of which I am an expert, and they should use the book I wrote to teach it.” It was hard not to be a little skeptical of his motives. At the same time, I can’t help but think that he’s right. Crockford says that if the compiler treats these 2 forms as equivalent, then there is really no difference (so long as you are consistent). These are Gut decisions. However, people will use their Head to try to rationalize their Gut decisions and come up with some ridiculous rationalizations. OK, fine. What does that mean in practical terms, i.e. writing code? Yahoo’s Best Practices for Speeding Up Your Web Site lists minimizing HTTP requests as the very first recommendation. One of the ways they suggest doing that is by using CSS sprites (which I mentioned previously in Clever Ways to Save Bandwidth). 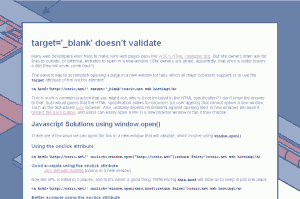 Web developers often use the attribute target="_blank" to force a link to open in a new window. However, if you use an HTML validation service to check your web pages, you know that the target attribute is not valid in strict versions of HTML and XHTML. In particular, the browsers that are not compatible with the U-M jobs site are Safari, Chrome, and Opera — browsers typically used by more tech-savvy users — so U-M may be missing out on the very candidates best-suited for work in today’s web-based world. That’s when it hit me. I should try a different browser.